Home Good For Beginner Vapers Innokin Endura T18-II Review- The Best Starter Kit Just Got Better! Innokin Endura T18-II Review- The Best Starter Kit Just Got Better! The Innokin Endura T18-II kit is as the name suggests the new version of the existing T18 kit. The original T18 kit was a beauty and I have friends who really loved it. So what can we expect from the new version? Well for a start the battery capacity is better – now you get a 1300mAh battery instead of the 1000mAh on the original. Also you have 3 power output settings. You can select from Cool (10.5W), Medium (12W) and Warm (13.5W). The tank is a newer version and now you get adjustable airflow and a protective magnetic cap to keep ming out of your drip tip. Apparently the original T18 coils will fit – but make sure to buy the correct type. If the coils in your kit have the “3” holes up the side – buy the T18-E coils, if yours have “5” holes up the side you will need T18 (not the E). They are not interchangeable! There are 5 colours to choose from – Black, Blue, Rainbow, Violet and Coffee. Thank you so much to Innokin who sent me a total of 5 of these devices – one in each colour. 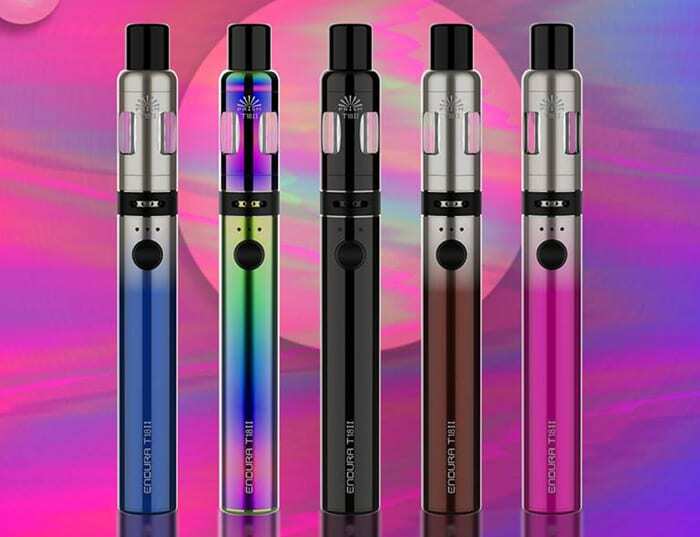 I have given 2 away to friends who currently use the Innokin T20-S and both have also used the T18 in the past too so will also be getting feedback from them. Especially as they are not into more advanced vaping devices. As usual I will report back honestly on my experience with the device I have in my possession. So let’s get stuck in! As mentioned above I received 5 of these – one in each colour. However as my favourites were the Rainbow and Violet versions I shall concentrate mainly on them. One thing to mention is I had difficulty with the packaging – on the 2 devices I used myself and trying to help my friend unpack hers. The inner “drawer” arrangement has a blue tab on to pull. Well this just pulls off in your hand and then on all three I unpacked I had to rip the outer sleeve to get into the package! First impressions are that this feels like it is a quality kit. The body of the device and tank is metal and has a paint effect rather than a coating. No rattles or wobbles and very solid – it does stand up but obviously being so tall it will fall with the slightest opportunity! Some feedback from people I gave the other kits to was that the instruction booklets were printed in such minute text they were really hard to read. The battery section of this device is a lovely weight and feels nice in the hand. There is a fire button which is a nice size and location and above the fire button are 3 small LED lights – which inform of battery capacity remaining and also power mode selection. Depending on which colour version you have there is a graduated spray paint effect moving up the mod – this is not so much apparent on the rainbow version and isn’t there at all on the Black version. The base of the mod just has text stating “Capacity 1300mAh”. On the opposite side to the fire button is the Micro USB port. At the top of the mod is the plastic black airflow ring. This moves smoothly and opens and closes off the 4 airflow inlet holes. I thought initially this was part of the tank but it isn’t. Basically the 510 connection (threaded part) on the tank is kind of hollow – not for e-liquid but the airflow from the inlets passes into the tank via the 510 pin – very unusual! This is a pretty little tank and the only branding is the “T18II Prism” logo in between 2 of the viewing windows. The first thing you will notice is there is a magnetic cap on the top of the tank – this is to protect the drip tip from pocket fluff etc. Remove the cap and it can be attached to the bottom of the mod as that is magnetic too – however it’s a pain in the arse when you do that and you will keep knocking it off. The tank is a top fill – you remove the top cap to access it – very much like the T20-S tank. The threads are great and despite the top cap being smooth it is actually really easy to remove! The drip tip is a 510 fitting, I tried some other tips in here and they fitted fine. You also get a spare identical drip tip in the kit. The base of the tank has the legal logos and as mentioned above the airflow control is actually on the battery – so there might be issues using this tank on another battery? I have only seen the tank for sale in a kit and testing the tank on another mod confirmed the fact you can only use this tank on the supplied battery. You get zero airflow if using on another mod. The tank and battery are packaged separately so you will need to screw them together. A coil is already installed in the tank so you just need to fill up, charge and you are ready to vape! There is a nice guide on the inside of the box lid and also a quick setup guide leaflet too – both are pretty good. Battery capacity = the light above the fire button will flash after vaping – 3 lights flashing = full, 2 lights flashing = half and 1 light flashing = low battery. Output control = to select the wattage output turn off the battery then hold the fire button down and the light above the fire button will cycle through each setting. Release the fire button when the setting you require is illuminated. The 3 lights illuminated = 13.5W, two lights = 12W and 1 light = 10.5W. Turn the battery back on with 3 presses of the fire button. Adjust airflow = rotate the black ring on the base of the tank – the more holes exposed means the more airflow. To make the airflow more restricted close off the holes one at a time. Use the supplied USB cable install the small end into the USB port on the battery. The lights will cycle through the level indications. The lights will go out when fully charged. This is a top fill tank so unscrew the top of the tank. Add e-liquid in the space around the coil – do not add e-liquid to the centre hole of the coil – if you do and try to vape you might have no lungs left from the spitting! Watch the e-liquid level through the tank window. Replace the tank top cap. If using a new coil or for first time use leave the tank to stand 5-10 mins for the coil wicking material to absorb the liquid. This may take up a lot of the liquid in the tank so check the level and refill as necessary. Make sure the liquid level is always above 1/3 full as lower than this could be difficult for the coil to wick and could damage the coil and you will get a nasty dry hit! Remove the tank from the battery. Turn the tank upside down. If a coil is installed this will just pull out of the tank. Insert a new coil into the tank and make sure the edges of the coil are aligned with the straight edges on the tank – once aligned push the coil in fully. Replace the tank base and fill as described above. How Does the Innokin Endura T18 II Kit Perform? As this is a low power Mouth to Lung (MTL) kit I am using a 50% PG/50% VG e-liquid. I will test with standard high nicotine e-liquid and also 20mg salt nic liquid. I will test this in each power output mode and also with the airflow in each setting. With all 4 airflow holes open – this is still pretty restricted. With all 4 holes closed there is still a slight bit of airflow – some tanks you can shut it down completely. In my opinion the range of airflow is spot on for a MTL device. I favoured the 4 holes open setting as I generally am more of a DTL vaper lately. Using Nicotine Salt liquid first – one of my favourites the Apollo Smoozie – Strawberries Gone Wild – 20mg nicotine strength. I used the Rainbow kit for this test. Starting off at the lowest power setting – 10.5W and this is already pretty good, I can taste the liquid and a decent amount of vapour too – not as much throat hit as I was expecting – but generally Nic Salt liquid does give you less of a hit. Moving up to the middle setting 12W this is a huge improvement, lots more flavour and vapour. Slightly more throat hit too. At the maximum power setting 13.5W the taste is really great and a wonderful throat hit. Also a lot more vapour than I was expecting. This is a huge step up in performance from the original T18 and on the highest power level it is very impressive indeed! I have used this for 7 days so far and the coil is still as good as the first day – so coil life looks like it will be great too. I had no spitting or dry hits either – excellent! So for this test I am using a 12mg standard nicotine e-liquid which I used a lot in pod mods. I used the Violet kit for this test. Starting on the lowest power – 10.5W I already get a great taste from my Blueberry liquid. Wow and the throat hit is immense! At the middle power setting – 12W I actually coughed! Wow this crashes into the back of your throat. The nic salt is definitely a smoother vape. OK let’s be brave and test the 13.5W power level… As expected quite harsh on the throat and I did prefer this liquid at the lower power settings. That’s why the power level options are so useful as the nic salt needed higher power whereas standard nicotine liquid is happier at the lower to middle end of the power range. My friend who also uses this kit with high nic liquid said that she was getting pretty much the same performance with this kit as she was getting with the T20-S with the 0.8ohm coil! This has a 1.5ohm coil – so that’s good going! The instructions are great so this is very easy to use – even for technophobes. The idea of different power levels can be a bit daunting to some users but they are simple enough to get to grips with. I would have preferred different colour LED’s to show battery life – i.e. green = fully charged etc. On this mod the battery flashes twice after pressing the fire button and sometimes if you are not quick enough you can miss this. Also having the airflow inlet and adjustment on the mod is kind of strange if you ask me. The power delivery was pretty quick and felt accurate. I did try to test the tank on another mod but there was zero airflow so it didn’t work! I mainly used this on the 12W power setting. If you use the lower or higher settings the battery life will vary. I found regular vaping I got 10 hours of battery life. Addition of adjustable airflow was a great update. Power level settings make it easy to change between standard high nic and nic salt e-liquid and get the best performance out of both. Excellent flavour, vapour and throat hit especially in the higher power setting. Airflow adjustment is on the battery. So you can’t use the tank or mod with other devices. Not a big issue if you are just expecting to use this device. Battery indication system not the best – you can miss the lights flashing sometimes. Other people reported issues trying to see the tiny text in the instructions. Again Innokin have created a cracking starter kit. This has been updated to include adjustable airflow and 3 power modes. Not that there was any big issues with the original T18 but these updates have massively enhanced it. The power output options I didn’t think would make much difference – but I was very wrong. Using nic salt liquid the Innokin Endura T18 II shone in the highest power setting. However with standard high nicotine e-liquid it was much better in the lower power settings. Therefore this device easily caters to both types of liquid and gives great performance for either. This is super easy to use, performs brilliantly and I think any starter vaper could do a hell of a lot worse. I worry sometimes if people get a crap starter kit they will get a bad first impression of vaping. The Innokin Endura T18-II kit will give them the best impression they could get. The target market is obviously the same people who would buy any of the Endura range and these people would be equally happy with this kit. Only a couple of slight niggles regarding the airflow location on the battery and the indicator lights. I did find the other people who I gave kits to didn’t always know how to adjust the airflow or the power and they needed showing how to do it – the instructions whilst to me were pretty good – didn’t explain this very well to others who weren’t as technical. When I gave my friend Abby this kit she was massively impressed. I hope she won’t mind me saying but she isn’t the most technical of people and doesn’t like changing devices as she gets used to what she uses the most. The first vape made her smile and she said it was lovely to use. However you need to remember you cannot use this tank on its own with another mod and you cannot use the battery with a different tank. The airflow design means no other components are compatible. Only an issue if you are looking to try different devices of course. Look I have only dropped a couple of marks for the Airflow and LED design. One big downside is you can only use this tank and battery with each other - other mods or tanks are not interchangeable. For a stock coil starter kit this is an excellent place to start, not too daunting but performs so well. The lower power settings suit high nic liquid and the higher power level was perfect for Nic Salt - so very versatile. Another great Innokin starter kit - well done! Veiik Airo Pod Kit Review – Executive Looks But Does It Vape Like A Boss? The Prism T1811 and love it…. except have you notice it LEAK?? and well I don’t think that’s the answer because I changed it and 2 days later it leaked!! Hiya I haven’t had any issues with either of mine – however this does ring a bell. My friend used the T18 tanks for a long time – the original one – which uses the same coils. She would have 2 or 3 coils in each pack which would just leak. I read online about it being down to the cotton inside – sometimes the cotton is uneven inside and when you actually look at the coil head some of the holes in the side have no cotton anywhere near them. Basically if you can use a needle/pin to move the cotton around to make sure all the holes have cotton showing it should help. Poke the needle into each wicking hole and sort of drag the cotton across the hole a bit. It is a pain in the bum though – I used to fully re-wick her coil heads and put new cotton in them all before she used them. So have a look at your coil heads and see if it is that. If so get on to Innokin about them as I have complained in the past too. Hi I have the Prism T1811 and the mouth piece is hot by the 2nd draw in it? Metallic taste in mouth also! What am I doing wrong please? That is quite strange – I have no issues with either of my T18-2 kits. Which power setting are you using and is the airflow fully closed? Also what e-liquid mixture (VG/PG) are you using?